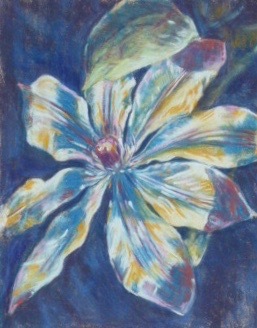 An unframed, unfixed pastel painting on sand coloured sanded card. The painting is 28 cm x 20 cm (11" x 8" ). I took a quick snap of this flower and it was the best photo I have ever taken! (I am not so hot with a camera.) In focus, clean and striking it inspired me to get out my paints.